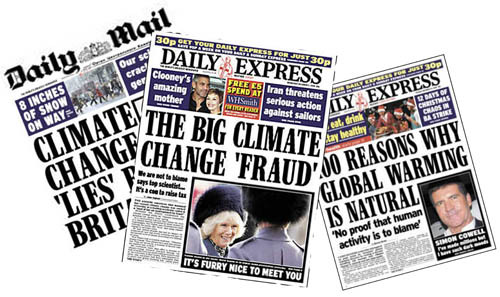 “Climate change scandal” – the headlines proclaim. In fact, the scandal is that the concrete and mounting evidence of the danger of climate change is being ignored by large sections of the media. It instead publishes stories implying the whole thing is a hoax. The Institute of Physics – whose statements about UEA’s “worrying scientific integrity” were jumped on by media sceptics to negate the whole phenomenon of climate change – have recently issued a clarification saying that, “our climate is changing, and we need to take action now to mitigate that change", while their submission, it has been revealed, is likely to have been influenced by an energy consultant. Next came ‘Glaciergate’ in early 2010. Buried in the 3000-page 2007 IPCC report, there was a brief mention of a claim that the Himalayan glaciers would melt by 2035. The claim was argued to be based on an error and The Times and The Express in particular implied that this significantly undermines the whole report, claiming that this was a “central claim", which is not the case. Nevertheless, the glaciers are retreating at an increasing rate. ‘Glaciergate’ encouraged the search for further ‘errors’ in the IPCC report. Jonathan Leake at the Sunday Times has been particularly keen, announcing ‘Amazongate’ in January 2010. The prediction that global warming might wipe out 40% of the Amazon rainforest was dismissed as an “unsubstantiated claim”. This story was sourced from a climate denial blogger. In fact, as BBC coverage on 30 January 2010 made clear, there is peer-reviewed research predicting this impact. The error in the report was that the reference given was a WWF report rather than primary research. The article was the subject of a IPCC complaint, which in June 2010 was upheld and The Sunday Times was forced to retract the article and issue an apology. This was followed by ‘Africagate’ - attempts to smear as unreliable the discussion in the report of possible impacts of climate change on African agriculture - and ‘Seagate’ - an incorrect figure which had been provided by a Dutch government agency for the proportion of the Netherlands below sea level, both in February 2010. See discussion at http://www.realclimate.org/index.php/archives/2010/02/ipcc-errors-facts-and-spin/#more-2832. Another Times article on 14 February 2010, World may not be warming, say scientists, cites work by Anthony Watts, a climate sceptic, on the location of temperature stations, alleging that some produce poor quality data. However, when the actual data is analysed, the poor quality stations are found to underestimate, not overestimate, any warming trend. On the same day, The Daily Mail claims Climategate U-turn as scientist at centre of row admits: There has been no global warming since 1995. However, not only did the scientist in question not say these words, but the article also contains other distortions. Futhermore, in 2010, sceptic ex-Conservative MEP Roger Helmer (now UKIP, as of March 2012) used European taxpayers' money in order to pay for advertisements that read '"Green' Climate Policies: Probably Unnecessary, Certainly Ineffectual, and Ruinously Expensive." This prompted our petition against Roger Helmer's use of taxpayers' money to fund denialist propoganda and to tell the European Parliament to disavow the ads and make amends by funding a real "information" advertising campaign about the threats that climate change poses. Read more about this here. Climate science is being confronted by growing doubt and criticism. The debacle of the 2009 and 2011 United Nations Climate Change Conferences, in Copenhagen and Durban respectively, clearly reflected the rejection of reality. The UK Independence Party (UKIP) is a staunch sceptic of climate change. At their Spring Conference in March 2010, the party leader Lord Pearson of Rannoch declared that "we must question the whole theory of man-made climate change." More information on their manifesto and policies can be found at the following links: https://www.ukip.org/content/latest-news/1500-lord-pearsons-wows-spring-conference, https://www.ukip.org/content/ukip-policies/418-energy-environment-ukip-policy-2009 and https://www.ukip.org/content/latest-news/1462-ukip-introduces-sceptical-eco-stance. The UKIP opposes the Climate Change Act as they do not view it as a global crisis, nor do they accept the agenda of reducing CO2 levels, since they do not consider CO2 a pollutant (https://www.ukip.org/content/features/552-climate-what-they-dont-want-you-to-hear). It calls for a halt of all UK contributions and funding for the IPCC and any EU climate-change policy such as the EU's Carbon Trading Scheme (http://croydon.ukip.org/articles/1445-climate-change-and-ukip-policy). Somewhat similarly, the British National Party (BNP) believes anthropogenic global warming is “non-existent” (https://bnp.org.uk/news/nick-griffin-leaves-climate-change-eurocrats-speechless). At the end of 2011, Nick Griffin, the party leader of the BNP, claimed that “[c]arbon trading is a money-making scam that enriches big business and the banks, at the taxpayers’ expense. A scam, moreover, that will have a devastating effect on the job market and the ability of Britain to sustain any heavy industry,” (https://bnp.org.uk/news/national/global-warming-scam-being-used-de-industrialise-britain) and that ”[c]limate change never was about drowning polar bears; it was always about big business profit and elite power.” (https://bnp.org.uk/news/national/what-lies-behind-man-made-global-warming-hoax). Shale gas extraction or ‘fracking’ is still viewed by many as 'sustainable energy saviour'. Two earthquakes have already occurred in the Bowland Shale around Lancaster after the independent energy company Cuadrilla launched exploratory work for natural gas extraction in 2011. The connection between the two was swiftly denied by Cuadrilla as 'unlikely' and instead propose as many as 200-300 wells over the next three to five years to meet proposed productivity levels. In the U.S., the Republican Party has adopted outright denial as policy. Doubts over the existence of global warming, whether it is human-caused and whether reducing CO2 emission is the most appropriate approach to tackle the issue are rampant among the Republicans particularly the GOP (Grand Old Party/Republican National Committee) presidential candidates. Some of their views can be seen and heard here: https://www.huffpost.com/entry/earth-day-republicans-climate-change_n_1444068 and https://www.theguardian.com/commentisfree/2011/sep/04/evolution-climate-republicans-president. This scepticism originates in part from ‘a long-term, well-financed effort on part of conservative groups and corporations to distort global warming science.’ (http://content.time.com/time/health/article/0,8599,2096055,00.html). In February 2012, leaked documents showed U.S. thinktank the Heartland Institute's core mission is to discredit the established climate science. It has been receiving support from wealthy individuals including the Koch brothers and corporations such as Microsoft and RJR Tobacco, and has been making payments to bloggers, experts, schools and scientists to cast doubt on climate science. Details can be found here: https://www.theguardian.com/environment/2012/feb/15/leak-exposes-heartland-institute-climate, https://www.theguardian.com/environment/2012/feb/15/climate-sceptics-pai-heartland-institute, https://www.theguardian.com/environment/blog/2012/feb/15/leaked-heartland-institute-documents-climate-scepticism, http://content.time.com/time/health/article/0,8599,2096055,00.html and https://www.reuters.com/article/2012/02/22/idUS334109598520120222. Undeniably, however, sceptics’ campaigns in the U.S. played a crucial role in preventing domestic and international policymaking and agreement on climate change and efforts to reduce global warming pollution. Below is a list of useful sites with facts debunking just about any climate sceptic myth. Skeptical Science, for example, lists over 80 myths, including "There is no scientific consensus on global warming"; "Scientists predicted an impending ice age in the 1970s" and “It’s caused by sunspots”. It has recently been revealed that Koch Industries, a little-known, privately owned US oil company, paid nearly US$50 million to climate denial groups and individuals between 1997 and 2008. In a similar period Exxon Mobil paid out around $17 to $23 million. Closer to home, it has been suggested that Shell's funding of an exhibition at the Science Museum may be linked to the museum stepping back from its earlier strong stance on climate change. We have put together a hall of shame featuring the worst offenders. These findings contrast dramatically with the popular media's reporting on climate change. One recent study analyzed coverage of climate change in four influential American newspapers (New York Times, Washington Post, LA Times, and Wall Street Journal) over a 14-year period. It found that more than half of the articles discussing climate change gave equal weight to the scientifically discredited views of the skeptics. Fight back on the blogosphere. Find out how here. Join our new Facebook group.